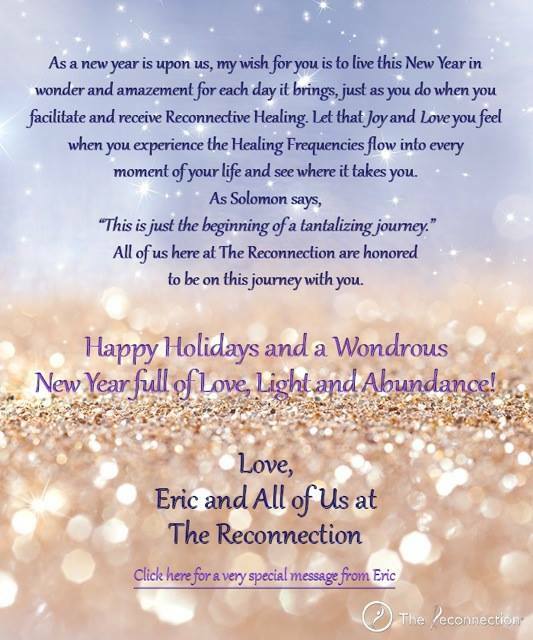 As a new year unfolds upon us, our wish for you is to live this new year in wonder and amazement for each day it brings, just as you do when you facilitate and receive Reconnective Healing. Let that joy and love you feel when you experience the Reconnective Frequencies flow into every moment of your life and see where it takes you. As Solomon says, “This is just the beginning of a tantalizing journey.” All of us here at The Reconnection are honored to be on this journey with you. Happy Holidays and a Wondrous New Year Full of Love, Light and Abundance!